Please join us on Thursday, November 12 at 7:00 p.m. in Axinn 219 to learn about new a public policy innovation that is helping accelerate progress on society’s most challenging social problems. 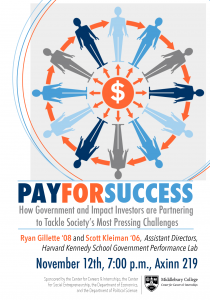 Pay for Success contracts (also called Social Impact Bonds) combine social impact investing, rigorous evaluation and data analysis, and government performance contracts to improve the delivery and impact of social service programs. This is a unique opportunity opportunity to hear about the impact that some of the early Pay for Success projects are making on reducing homelessness, improving access to early education, reducing recidivism, and other critical issues for states and cities. 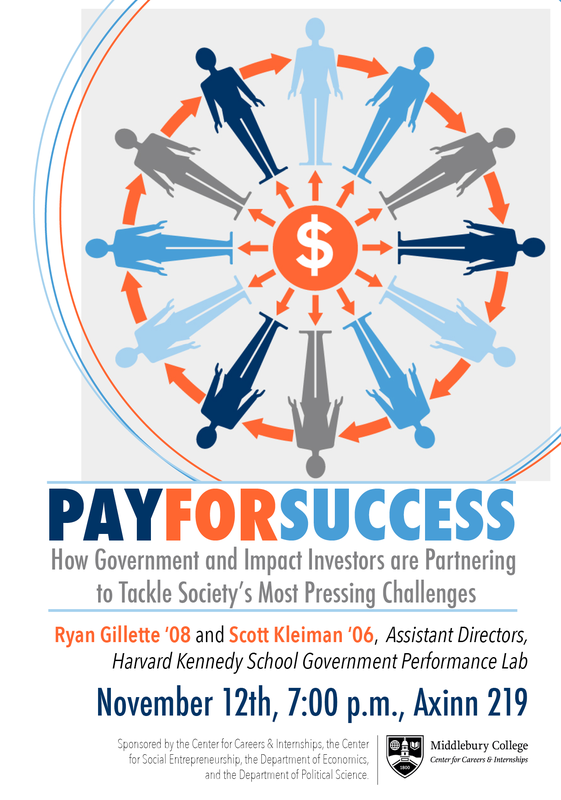 Middlebury alums Ryan Gillette ’08 and Scott Kleiman ’06, both Assistant Directors with the Harvard Kennedy School Government Performance Lab, will be sharing their experiences from the front lines of leading this work with city and state governments around the country. The session may particularly appeal to students considering careers in government, nonprofit leadership, social impact investing, or economics.